This faithful group works behind the scenes to prepare the altar and other areas of the church for Sunday worship and other special services. If you like to sing, visit us. Opportunities are noteworthy for various kinds of choir participation. Your singing voice is in special demand to do God’s work. Come lend us your voice! Serving at the altar and bringing the sacraments to those who are in the hospital or home bound is the sacred ministry of these people. Confirmation is required, as is training in the recognition and prevention of sexual misconduct (provided by the Diocese) and new members are welcome. 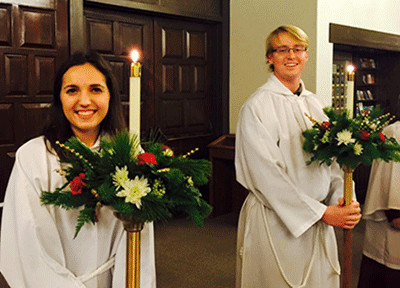 If you are between the ages 9-18 we invite you to join the Acolytes. 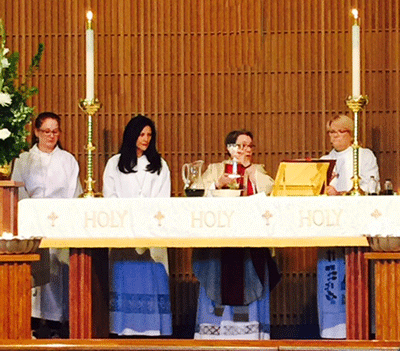 Acolytes play an important part in leading Trinity’s worship services. Sign up today! Training provided. This ministry provides an orderly welcome for everyone. An easy way to serve the Lord is by extending Hospitality to strangers and friends alike. We need you to help welcome guests and prospective new members at our front door on Sundays.